I fear the Republic no longer functions, but we must keep our faith. Communications infrastructure outages can occur for any number of reasons, from natural, weather-related disasters to man-made causes such as human error, jammed/full networks and vandalism/terrorism. Gordon has responsibility for the strategic positioning and development of Inmarsats future Ka-band business in the Government and Military sectors in the U.K., Europe, Middle East, Africa and Asia Pacific. Trusted communications and information sharing play a critical role in the operations and effectiveness of the U.S. Military. This year, the Military Communications Conference (MILCOM) will focus on this important issue as MILCOM 2012 celebrates more than 30 years of gathering the best of military, industry and academia. Event: Promoting Australasias Satellite Capabilities, The annual Australasia Satellite Forum provided a unique opportunity for open debate and discussion of the satellite industry in the Asia-Pacific region. Satellite communications is a growing global market due to an ever increasing demand for bandwidth to support fast, high quality communications across a wide variety of industries and geographical regions. According to recent figures released by the Satellite Industry Association (SIA), world satellite industry revenue was US$168.1 billion in 2010 and the market has experienced an average annual growth of 11.2 percent over the last five years. For too many years, there has not been a major push toward improving the mobility and flexibility of the Sensitive Compartmented Information Facility (SCIF). This runs contrary to other segments of the construction industry, within which you can quickly expand and/or relocate and/or reconfigure modular units as needed. If we can quickly expand and even relocate offices, public-school classrooms, medical facilities and restaurants, then why cant we do the same with SCIF? 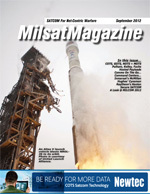 Given the preponderant use of non-U.S.-manufactured launch vehicles by the commercial satellite industry, the Hosted Payload Alliance (HPA) recommends adjusting the foreign launch exemption process to facilitate routine and early consideration of solutions featuring U.S. Government payloads hosted on commercial satellites likely to be launched overseas. Contributing Editor Mike Kelley spoke with Lt. Gen. (ret.) Mark Curran, Vice President of Army Programs and Huntsville Operations for L-3 Communications. L-3 supports a variety of businesses, but is primarily a supplier of electronic and communications products to the DoD. In July, L-3 finalized the spinoff of Engility, a new company that comprises much of L-3s former government services business. In Huntsville, L-3 supports a wide variety of federal programs and agencies, including the Space and Missile Defense Command. and MDA. Nearly two hundred exhibitors and thousands of attendees, including SatNews contributing editor, Mike Kelley, converged at the Von Braun Center in Huntsville, Alabama, from August 13  16, for the 15th annual Space and Missile Defense Conference, where they shared information relating how space-based assets can respond to a host of national and non-national threats. The disconcerting spread of asymmetrical warfare represented by insurgents, terrorists, and drug cartels has forced military forces to change the way they operateespecially when tasked with reconnaissance. Lieutenant General Ed Hanlon is a retired United States Marine Corps general officer. His 38 years of service included a broad range of command, operational, staff and joint assignments throughout the United States, Europe and Asia. Hanlon was the Commanding General of the Marine Corps Combat Development Command and Deputy Commandant for Combat Development. Event: ISR Decision Makers Will Be Present With Solutions, The goal for government attendees at Future ISR 2012 is to identify new ways to achieve interoperability. Lower budgets resulting in smaller troops has lead to joint C4ISR being the most crucial asset in global MoDs reserve. Chuck Cynamon is responsible for strategic initiatives to apply the companys broad range of SATCOM technologies and services to the worldwide defense marketplace and intelligence community. This includes fixed Ku-, Ka- and X-band VSAT systems and mobilesat products and systems. Applications cover satellite communications-on-the-move for ground-based and airborne platforms along with numerous classified development programs. Chuck has more than 20 years of experience in military space systems as a program manager for large, complex space programs and as a space systems operator.